Hello and welcome to the first Deepdale Podcast. We thought we’d try something different, and see whether you like it, so here we are and hope you enjoy listening. In the words of Groove Armada, ‘If you’re fond of sand dunes and salty air, Quaint little villages here and there’, then this podcast is for you. We’ll be chatting about what’s going on at Deepdale Backpackers & Camping and in the local area along the beautiful North Norfolk Coast. Like all experiments, we won’t be perfect first up, so bear with us. The quality may be iffy, but we hope you enjoy the content. What is one podcast out of a series? An edition or an episode? We are going to use edition, as episode sounds like a drama, and at the moment there are no plans for the Deepdale version of the Archers. Although, having said that, if the Radio 4 want to get in touch we are available to chat! And there will be a quick round up of local events happening in June, including the upcoming Sunday Session with Lisa Redford. Recorded in the car enroute from work. 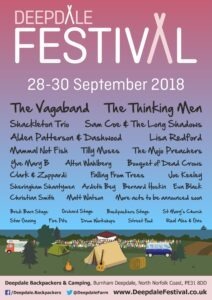 Quick reminder of the dates for Deepdale Festival 2018 – There will be live music on Friday 28th, Saturday 29th and Sunday 30th September. 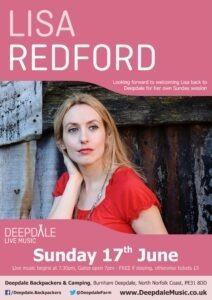 This month’s Deepdale Music event is the Lisa Redford Sunday Session on Sunday 17th June in our backpackers courtyard. There will be a bar, fire pits and of course great music. We look forward to welcoming back The Wood Fired Food Co for their pizza nights most Fridays, and Currylicious for their curry nights most Saturdays, both in the backpackers courtyard. Cheer on the hardy walkers who are taking part in the gruelling Coastal Walk Challenge on Friday 8th and Saturday 9th June. These fundraisers walk 47 miles through the night from Hunstanton to Cromer raising funds for the Community Sports Foundation. Sunday 10th June is Open Farm Sunday, and there are many events happening across the country. However why not visit Holkham that day, as it is the birth place of modern agriculture. Enjoy a Wildflower Meadow Walk at Pensthorpe on Wednesday 13th June. The classical music programme at Holkham continues on Saturday 16th June with a concert in the marble hall. Sunday 17th June is fathers day and we have a few suggestions for you. Holkham have two great events, a Dune Discovery walk at Holkham beach, and Father’s Day Dens and Fire. However you plan to treat your father, definitely bring him along to see the wonderful Lisa Redford, who is performing a Sunday Session in our backpackers courtyard that evening. On Sunday 24th June Lionel Richie steps on stage at Holkham for their big open air concert. The Royal Norfolk Show takes place on Wednesday 27th and Thursday 28th June. Deepdale will be there with a ‘Mini Deepdale’ stand, and we are looking forward to having MarGins Walking and Glamping, Retro Campers Norfolk and the Norfolk Coast Partnership with us. Find us on stand 230 for a chat. You can also find full details of the Deepdale Music programme, which includes sunday sessions, outdoor theatre and more. Lisa Redford plays her Sunday Session on 17th June. 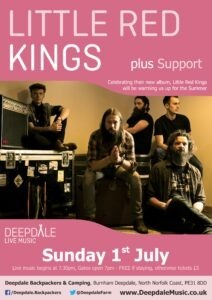 The Little Red Kings, supported by Das Fenster and the Alibis, play their Sunday Session on 1st July. 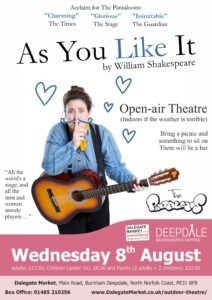 And we host the Pantaloons for an evening of outdoor theatre performing As You Like It on Wednesday 8th August. More Deepdale Music dates will be announced in due course. If you would like to be involved with this podcast, then you are more than welcome to send us your recordings and videos for us to include in the Deepdale podcast and our blog. Why not tell us about your favourite Norfolk beach, review a local place to eat, or simply tell us what you love to do on the beautiful North Norfolk Coast when you come to stay at Deepdale. We hope you’ve enjoyed listening this first Deepdale Podcast. As always please let us know what you think, with comments on social media and on our blog. I’m Jason, and the other voice in this edition was Chris. You’ll hear many other voices in future podcasts. Thanks for listening, and hope to see you at Deepdale again soon.